Optional: About 3 rashers of Canadian (Back) Bacon, or about 3 slices of ready-to-eat Ham, or about 10 to 12 medium ready-to-eat Shrimp (remove shells and tails). Put some water in a pot, add a little salt, and boil. Cook the pasta for about 10 minutes in this water (if necessary see instructions on the pasta's packaging) until it is cooked al dente, and ready to eat. Alfredo Sauce using our Alfredo Sauce recipe. If using Bacon, cook it. After it cools, cut it into small pieces. If using ready-to-eat Ham cut it, into small pieces. If using ready-to-eat Shrimp, remove any shells or tails. 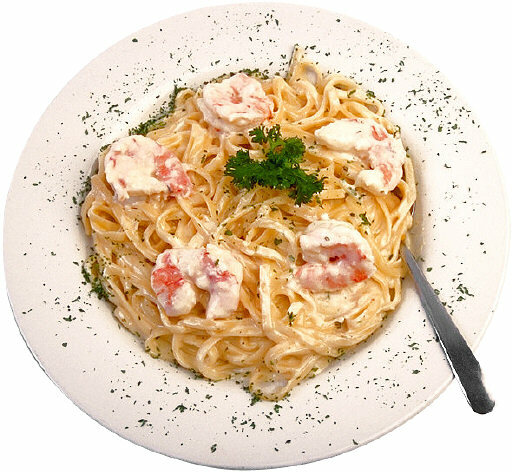 When the Fettuccine is cooked, drain it, and mix in the Alfredo sauce, and if using them, the bacon, ham or shrimp. Mix thoroughly, and then serve sprinkled with a little fresh chopped basil and a sprig parsley.